Until last weekend, I thought I knew the Flint Hills National Scenic Byway and its communities fairly well. In fact, two decades ago I remember dragging a friend to Strong City on my first “travel writing assignment” for my college newspaper. I can list for you the favorites – like the The Hays House Restaurant in Council Grove. On this trip out, I was happy to see these old friends and thrilled to find great new faces and places that only convince me further: The Flint Hills are a great travel destination. I began traveling north on Highway K-177 from Cassoday on a beautiful Sunday morning. At the recommendation of a cousin, I was looking for the mile-long limestone fence outside of Matfield Green. The small town of Matfield Green encapsulates the magic of the Flint Hills. Recently, artists from around the world have gathered here, inspired by the colors, the space and textures of the prairie. Vacation rentals, including the Matfield Station “casitas” (former bunkhouses built by the Santa Fe Railroad) offer peaceful retreats, and a new gallery/coffeehouse called “The Bank” serves up good coffee. 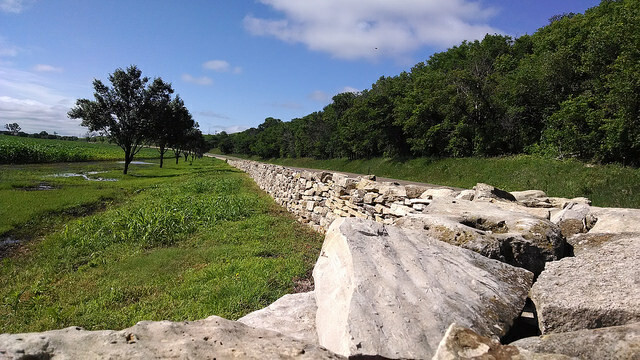 I saw the distinctive mile-long limestone fence near the former acreage of Charles Rogler, an Austrian immigrant who settled in the region in 1859 and became an established farmer and rancher. The Rogler house and ranch has since been transformed into Pioneer Bluffs, a nonprofit organization committed to preserving the ranching and farming heritage of the region. It’s easy to feel energized by all the possibilities of Pioneer Bluffs. I wanted to add all of its special events to my calendar, and I rushed to put my name on all possible mailing lists. Art and culture meets history and community during the Fall Festival, one of the organization’s most popular annual events, held the first Saturday of October. “A Day on the Farm” youth program invites kids to experience ranch history and outdoor life through hands-on outdoor activities. Throughout the year, it’s also possible to help in the community garden, attend a prairie talk discussion group or work on the restoration team. I was taken in by the simple beauty of the 1908 farmhouse, once the home of Henry and Maud Saubel Rogler, and now the Gallery at Pioneer Bluffs. Featuring exhibits by local, national and international contemporary artists, the gallery takes advantage of the natural light, the woodwork and space to highlight artwork inspired by the tallgrass prairie, landscape and sky. My favorite piece was a black and white photograph of a cow with a wise, gentle countenance. Part of a series of cattle photos by Flint Hills photographer Don Wolfe, the photo reminded me of a member of the small herd we had years ago. Transfixed by something very human in the beast’s eyes, if I had my wish, I would have purchased a print for my mom, my grandmother and my sister. I took my time wandering through Cottonwood Falls and set out for some trail time at the Spring Hill Ranch. Passing through Strong City, I noticed the sign for Ad Astra Food and Drink. I’d heard of it through the grapevine (I later learned the restaurant doesn’t advertise beyond social media) and was excited to have a closer look. Ad Astra holds true to its commitment to local and regional “new American” foods with fresh menu offerings, including Kansas-raised bison and longhorn and grass-fed lamb. But there are surprises – like a watermelon and pork belly salad, smoked mac and cheese with duck, fried Brussels sprouts, and a first-rate beer selection. Check Ad Astra’s Facebook page for a complete menu. Also note that the restaurant is open only on weekends. “I’m going back there,” became my weekend mantra. I’ve been scouting out a location for our upcoming family reunion – searching for a place that can satisfy a diverse group of people with diverse interests. I think I’ve found it along this beautiful stretch of Highway K-177, where my old favorites gracefully meld with the new. This is just a glimpse into all the adventures this Southern Flint Hills itinerary offers. Don’t miss reading about other Yellow Brick Road Trip adventures at TravelKS.com. Jessica is a teacher, librarian and mom who lives in Holton. She loves all things summertime: Gardening, lazy days at the lake, farmers&apos; markets, and family vacations. Some of her favorite Kansas places include the Art Lab at Washburn University, the Topeka Shawnee County Public Library, the Konza Prairie and Main Street in Newton.